Is it possible to only shop at farmers markets? With so many benefits to shopping at farmers markets, is it possible skip supermarkets altogether and only shop at farmers markets? It is, and I have been doing so for 3 years. I remember thinking that I couldn’t possibly find everything I needed. Maybe one meal’s worth, but all three? everyday? Yep, it’s possible and the benefits are extraordinary. I spend less money, eat much better, my health is actually improving (I’m losing the fat! ), and I have become part of a community. I know my bread-lady, meat-man, old-school Italian (he says to me: “hello-uh big-uh boy”), the avocado savant, and even a Mexican cactus farmer. The variety of foods at the farmers market is quite deep, so deep that it will take you months to explore all of them. There is no lack of possibilities for feeding yourself. This makes three meals a day easy. The only snag is that while you know how to make Mac n’ Cheese, you probably don’t know what to do with Chard. There is a learning curve but most people seem to enjoy that part of it. Next, is cost. If you compare, item to item, the food at the farmers market is more expensive than the supermarkets. But, if you compare value (i.e. nutrition) then the farmers market is an extreme bargain. The easiest way to explain this is think of foods considered to be of very little nutritional value, like popcorn. You can eat a whole jumbo popcorn and still feel hungry. Popcorn is food and a vegetable but it doesn’t contain enough of the vitamins and essential nutrients our bodies need. Yet, it is extremely cheap to buy at the supermarket. Think of farmers markets as the exact opposite. The foods sold there are designed to be jam-packed with vitamins and essential nutrients. So much so, that you get full really quickly. I often find myself eating half of what I used, sometimes one-fourth. That is especially true when it comes to our health. When you put less food in your body, you lose weight. When you put higher quality food in your body, your health improves. Oh, and higher quality food tastes better too. I could talk for hours about the impact this has on how I look, but suffice it to say, I’m in the best shape of my life. Depending on the size of your local farmers market, there are some things you won’t be able to find. Coffee is the most obvious one, so is chocolate and tea. For specialty items like these I shop at my local health store. They tend to stock higher quality, more nutritious products (though nowhere near the quality at the farmers market). Lastly, is the winter stores. There are still plenty of things to buy during the winter, even in especially cold regions. In fact, a large part of French and German cooking is about cooking things sold only in the winter (French Onion Soup, mmm!). But, sometimes you just want a tasty watermelon or juicy pear in January. This is easily solved by creating your winter stores. Buy your favorites at the farmers market when they are going out of season and on sale for steep discounts. Cut them up into squares, freeze them, and don’t let anyone touch until the depths of winter. These are the important things to know when making the switch to an all farmers market diet. Everything else you can learn at the market, from buyers and farmers. You can ask them anything, about quality or how to cook, and they will answer. That’s why they sell at the market and not the supermarket. They’re part of the rising sub-culture dedicated to ideal health and amazing food. Go ahead, make the switch and see what happens! Continue reading Is it possible to only shop at farmers markets? Posted on August 25, 2012 Author robotchampionCategories defaultTags all, benefits, cost, diet, essential, farmer's market, health, lcoal, local, nutrients, nutrition, vitamin, winter, winter stores9 Comments on Is it possible to only shop at farmers markets? I read a lot of comics and it is always upsetting that there are no women creating them. There are female characters everywhere in the stories, many super heroines, and yet, nearly all the top female characters have all-male teams working on them. It is pretty sad, and unfair. Womanthology; Massive All Female Comic Anthology! 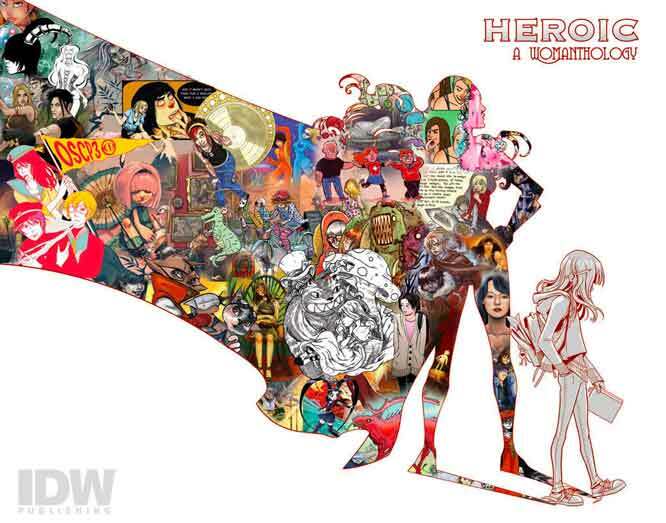 Womanthology is a large scale anthology comic showcasing the works of women in comics. It is created entirely by over 140 women of all experience levels, including top industry professionals. The purpose of the book is to show support for female creators in comics and media. There will be multiple short stories, “how to” & interviews with professionals, and features showcasing iconic female comic creators that have passed, such as Nell Brinkley and Tarpe Mills. A Kids & Teens section will also be included, showcasing their work, and offering tips & tricks to help them prepare themselves for their future careers in comics. Overall, this is pretty much a huge book showcasing what women in comics have accomplished, and what we are capable of 🙂 We are also hoping that by doing this book, it will encourage a new generation of women to pick up the pencil and create!